After a thirty-year gap since the last Mad Max film, the original director and co-writer for the whole series, George Miller, returns with a new instalment that is possibly-a-sequel, maybe-a-reboot; in the tradition of cheap, over-the-top trilogies like Leone’s Dollars, Romero’s Dead or Sam Raimi’s Evil Dead, rather than following a single story across the films, we instead get the same basic idea continually remade with increasing budget and ambition. This particular Mad Max takes about eighty percent of its plot, aesthetic, and structure from the most polished of its predecessors, Mad Max 2: The Road Warrior, with a scattering of ideas and images from the first and third films. It’s a bold move but it pays off. That said, it’s not nearly as bold a move as filling a two-hour film with a 110-minute car chase: there’s something about that concept so gloriously outré, so sophisticatedly dumb, that you can’t help but smile at the balls of it. The film is just packed with smaller things, too, that you’ll have to smile at: look out for the chain fight, the guitar man, the mysterious crow people, the death of the main villain. George Miller, billed in the advertisements as a “Visionary Director”, has lost none of his inventiveness in staging action scenes, nor his intuition for the cinematic. And it’s just glorious to see an old-school film full of old-school stuntmen and women doing preposterous things for the sheer Hell of it – and our entertainment. CGI has been used only to conjure the impossible; our drivers skirting around a huge, beautiful storm cloud early on is a particularly memorable image. Plotwise the film pays off like never before. Previous instalments all had weird plotting, shoving the whole story into the front or the back to keep room for the spectacle. The story here is nicely – and impressively – parcelled out in terse bits of dialogue that occur while people are shooting, fighting, or driving. 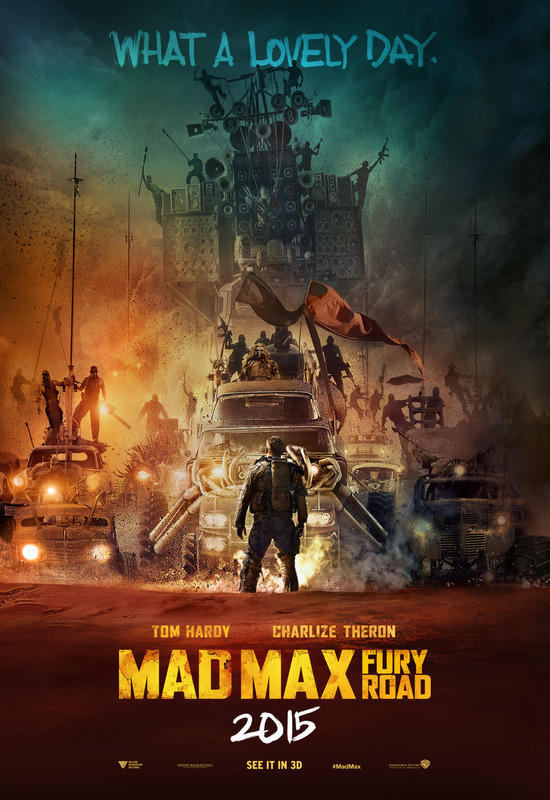 It’s smart, disciplined writing, and manages without dull exposition to give a unique personality to each of the surprisingly large core cast, including “Mad” Max Rockatansky; Charlize Theron’s badass driver Imperator Furiosa; her cargo, the Five Wives of bad Immortan Joe; and Nicholas Hoult as Nux, the sickly War Boy. If that sentence is mostly incomprehensible to you, then that’s a sure sign you’re in Mad Max territory. As nostalgic and spectacular and awesome as this film is, though, there were two interrelated factors that just kept it from feeling like a true, 1980s Max: first, Tom Hardy has all the charisma of Mel Gibson and then some, but he lacks the charm, too often reverting to the Hardy trick of hunching up his shoulders, scrunching up his eyebrows, and going crazy with his hands. While the original Max was only “Mad” in that he was angry, this one might be mentally ill. When Hardy’s Max does speak, the accent that comes out sounds a bit like an Englishman raised in the Middle East, or a white Kenyan. It sounds a bit like a watered-down version of Tom Hardy’s Bane, who in turn surely owed something to The Road Warrior’s Lord Humungus. It’s certainly not the broad, but mild, Australian that gave the original films so much charm. Charlize Theron is generally pretty excellent at tough-yet-feminine roles, so she didn’t have to exert herself much here, but she could have made some effort with the accent. The signature violence of the series seemed to me to have been toned down; while the most violent scenes are enough to make an audience gasp, or laugh, or cringe, their power comes mostly from what is implied, rather than shown, and I often got the impression that Miller was holding back for an extended, blood-and-guts version for home media. The film’s certificate is only a 15. Oh well. Genuinely though, these were only minor niggles in the most perfectly 80s B-movie to come out since – well, the 1980s, probably. I grinned the whole way through. Have you seen Mad Max yet? What did you think and do you agree with Christian? Let us know in the comment box below and be sure to visit Christian’s site Mediocre Batman! Yeah… what the hell was up with the accents??? 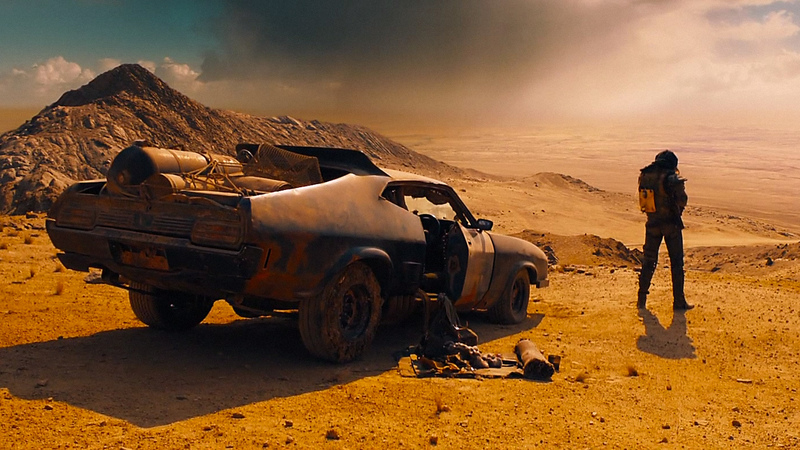 It was peculiar, a bit like the American cut of the original Mad Max where everything was dubbed over. For the most part the film seemed fairly uncompromisingly Mad, so I’m surprised Miller didn’t insist on getting the accents right (aside from a few really small parts). I have seen the American cut of the original Mad Max and it took me half the film to figure out what was off about it. Considering how bad Tom Hardy’s Russian accent is I actually wouldn’t be surprised if Miller just gave up. My Blu-Ray of Mad Max plays the dub as standard, you have to remember to switch from English to Australian English in the Audio submenu before pressing play. It’s quite annoying, as if they’re saying the American version is more legitimate than the original. For some reason I got the impression that Tom Hardy would be OK at accents, but I don’t know where I got that from. I didn’t catch Child 44, though it looked quite promising I thought. Ah thanks for the award!